Reuse applications throughout the world require tertiary treatment to ensure that water quality standards are met. Aqua-Aerobic Systems is a leader in tertiary treatment for reuse using membrane and cloth media filtration technologies. Cloth media filtration provides consistently high effluent quality that meets most reuse standards. A variety of cloth media options and mechanical configurations are available to provide a custom engineered system for each effluent quality requirement and site. Aqua-Aerobic Systems offers three cloth media options that have received California Title 22 approval. Aqua-Aerobic Systems membrane solutions are ideal to meet the most stringent reuse requirements with the no-break polymeric and ceramic membrane options. 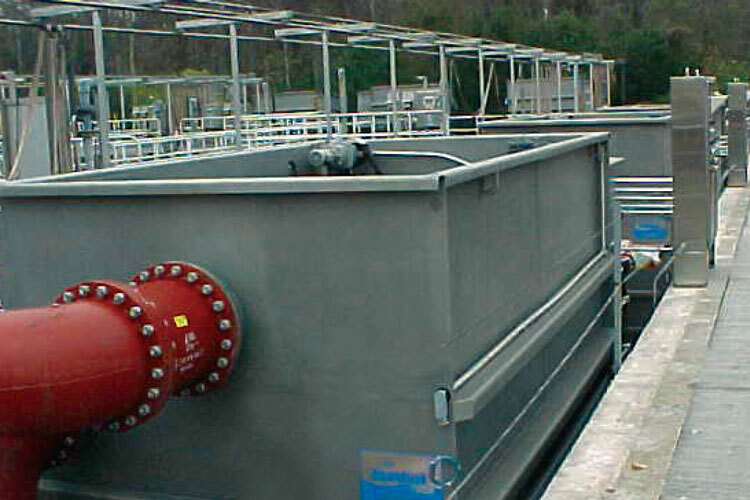 In October 2003, (3) of the plant’s existing traveling bridge sand filter basins, supplied by another manufacturer, were retrofitted using (8) 12-disk package steel AquaDisk cloth media filters.